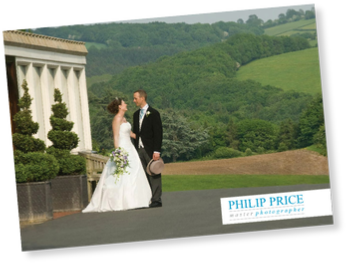 Click here or the above picture to download a .pdf* of Phil’s wedding brochure (1.5MB). We offer a flexible system to give you maximum choice. If you want just your wedding image files that is fine. If you’d love an album we have a great range of styles & sizes. Attendance fee: £350 for a weekend wedding, £295 for a weekday. Digital files: £350 with an album, £600 without. The attendance fee is taken as a non-refundable deposit and is payable when you book. There is nothing else to pay until you see your pictures. You then choose an album and/or the digital files. To check Phil’s availability please call 01989 564478 or email the studio. As a next step we suggest you visit the studio to see Phil’s wedding display albums. Each is a copy of customer’s wedding album, not just collections of best shots! Wedding photography is available Monday to Saturday.